At Stay Alfred, Airbnb meets the upscale hotel. Founder Jordan Allen says his company has staying power for a simple reason: It puts travelers where the action is. ROOM KEYS. In Seattle and across the United States, Stay Alfred offers hotel-room reliability in apartments and condo units that it manages. Jordan Allen is a real guest star. Allen is the founder and CEO of Stay Alfred, a fast-growing Spokane-based company that leases more than 1,400 high-end apartments, lofts or condos across the United States to tourists and business travelers for short-term stays. The company, which he started in 2011, advertises units in desirable, walkable downtown areas steps away from restaurants, shopping and events. Guests enjoy several in-room privileges they normally don’t find at hotels, including washing machines, dishwashers and full kitchens. They also don’t have to deal with other people’s things, as in an Airbnb rental. Unlike Airbnb, Stay Alfred manages the spaces rather than brokering them, so it doesn’t face the same issues or challenges from a regulatory perspective and works with every city to maintain compliance. 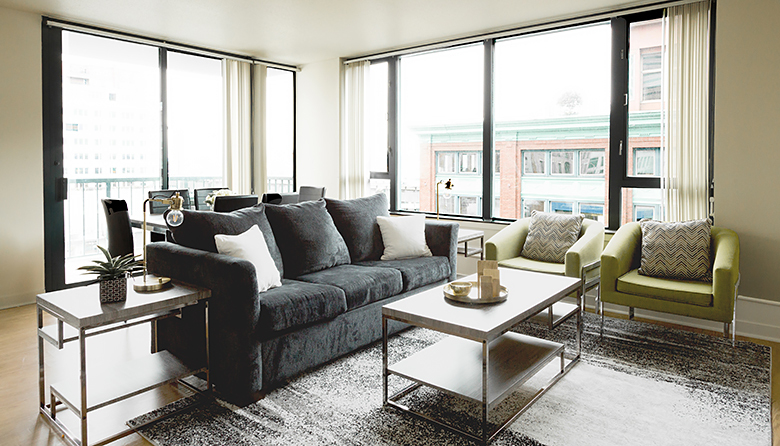 The company, which has seven properties in Seattle — in the Belltown and Denny Triangle neighborhoods as well as downtown — now offers units in 28 U.S. cities. Seattle, Portland, Nashville and New Orleans are particularly popular destinations for company clients, Allen says, but newer cities are proving popular as well. On its website, Stay Alfred offers clients comprehensive recommendations for things to do in each city. While major cities like Philadelphia, Washington, D.C., Chicago and Dallas are key areas of focus, Stay Alfred also operates in smaller cities, including Spokane, Boise, Savannah, Georgia, and Tempe, Arizona. Rates tend to be more affordable than nice hotels, according to recent listing information on the company’s website. In Seattle, rates start from a low of $76 to $110 a night and rise depending on the number of bedrooms and bathrooms needed and the number of guests. Allen got the idea for Stay Alfred while serving in the U.S. Army. He and his brother had gone to Denver to see a Colorado Rockies baseball game and stayed in an apartment within walking distance of downtown and other amenities. Allen, who self-financed the launch, thought travelers would embrace booking with a network of high-end apartments as vacation rentals in popular city destinations. The name Stay Alfred is a combination of Allen’s name and his former business partner, Conrad Manfred. In 2017, Stay Alfred posted $34.8 million in revenue, up from about $25.2 million the year before. It posted another sizable increase last year, Allen says. The company has landed on Inc. magazine’s 500 or 5000 list of fastest-growing private companies three years in a row and now employs about 240 workers — 140 in Spokane — and expects the number to climb to 450 by next year. It recently moved from cramped quarters near downtown Spokane into larger space in Spokane Valley, where Allen was raised. TAKE A DIP. Stay Alfred’s units at 1221 First Ave.in Seattle include access to this indoor swimming pool. Stay Alfred has been funding its expansion in a variety of ways. Last fall, it filed to register the sale of $40.4 million in securities, according to filings with the federal Securities and Exchange Commission. Earlier, the company sold $15 million in securities. The privately held company also recently raised $47 million in a Series B funding round, bringing its total funding to $62 million. Last year, it raised $15 million in venture capital from an undisclosed Seattle-based private equity group. The new round was led by Nine Four Ventures, a Chicago-based real estate technology fund. “Stay Alfred is defining a new hospitality segment,” says Nine Four General Partner Kurt Ramirez. The largest segment of rental customers is 35 to 45 years old, followed by millennials. About 15 percent of customers are retirees. The average stay is three to four days. Company clients increasingly include business travelers, who now account for about 30 percent of the business — a segment Allen expects will grow. Some business customers stay six months or longer as they get settled in new cities or travel between offices. The film industry is another lucrative target. Production companies often relocate hundreds of employees while producing entertainment projects; NBC Studios recently booked Stay Alfred rentals in Nashville for 30-plus days. The company is increasingly opportunistic. It leases individual units under long-term contracts but is now “trying to take over multiple floors or the entire building, so we can control the guest experience,” Allen says. It also seeks national partnerships with companies that own multiple buildings in various cities and actively markets to both developers and property managers by emphasizing that it reduces vacancies in buildings. On its website, Stay Alfred says its developer partners report, on average, a boost of 20 percent in net operating income because of increased occupancy. It recently added posh Spokane inventory by securing an entire floor with 15 apartments in the upscale M Apartments, a newly redeveloped property in a former Macy’s department store in the heart of downtown. The company will often commit to leasing units early in the development of a project, allowing it to negotiate rents at more favorable terms — an important consideration because it must still pay rent when its units go unoccupied. Unlike at an Airbnb rental — where keys might be hidden under potted plants or doormats — Stay Alfred has invested heavily in technology, which Allen says provides a huge advantage. It has developed a proprietary revenue-management platform and recently updated its website with features such as the ability to book multiple rooms and trips at once. The company often finds employees who are graduates of regional universities for its large software-development team, as well as for jobs supporting guest services, sales, accounting and for local operations in each city. Several customer reviews on Yelp laud the company’s services, though a few focused on complaints, such as cleaning fees that allegedly were not disclosed. Allen says the company promptly addresses concerns with customers. On its website, the company says its average approval rating is 8.9 out of 10. Eventually, Allen wants to expand internationally, but for now he’s focused on managing the company’s white-hot growth throughout the United States. It appears Allen and company have plenty of room(s) for growth.